File Name: Gabriel A. Kelly of Boston, Massachusetts. Notes: Boston is on the Atlantic coast and is the state's largest city. The other Joes from Boston are Blocker and Col. Courage. Also from the larger metro area are Cross Hair, Side Track, Space Shot, and Wide Scope. 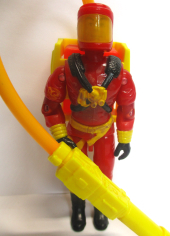 Sunbow's Barbecue wore his 1985 outfit in a truer red and was often seen without his helmet, with curly red hair. Barbecue's file name was mentioned in the episode Captives of Cobra, Part 1. 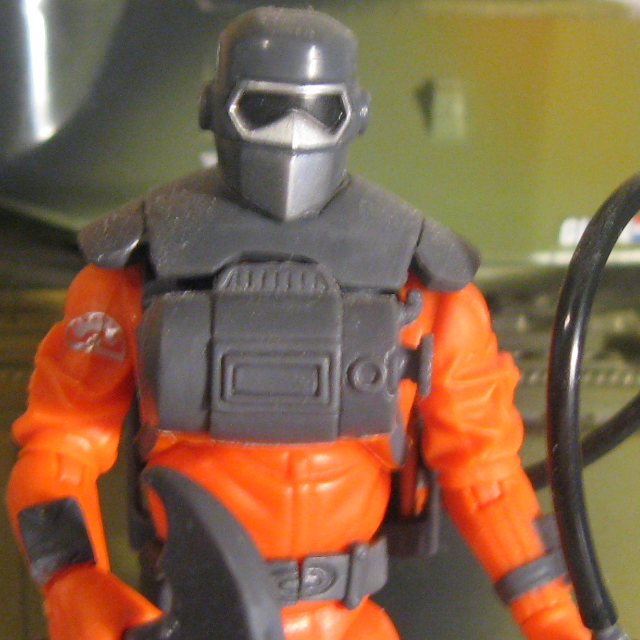 His appearance in the DiC series was only loosely based on his 1989 outfit, with a redesigned helmet, brown short-sleeved shirt with black elbow-length gloves, and green camo pants. 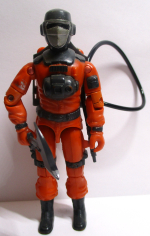 Accessories: dark grey extinguisher pistol with hose peg and notch on side (new), dark grey fire axe with smooth, grooved handle and silver edge (new), dark grey frame backpack with clips on side for tanks (new), red-orange foam tanks with peg for hose (new), long black hose (common). If Kelly hadn't joined the G.I. Joe Team he would have been the seventh Kelly in his direct line in the Boston Fire department. His love for the job is not based on family loyalty or even a more general sense of duty; he simply likes riding on the back of the truck with the wind in his face and sirens wailing, lights flashing and the bells clanging. Being allowed to knock down doors and smash windows with his axe is just frosting on the cake. "Barbecue is what you call your basic party animal. He can open bottles with his teeth, pick up quarters with his ears, and wrap his lips completely around the bottom of a quart Coke bottle. You may well ask how all this affects his function as the G.I. Joe Firefighter... It doesn't. It simply makes him a more interesting fellow to have around." Toy Notes: Item #6445. Featured in 1985's A.W.E. Striker commercial. Re-releases: At some point Barbecue may have been available by mail. (Red-backed filecards exist.) A recolored version was released in India. Accessories: dark grey extinguisher pistol (85 Barbecue's), all-dark grey axe (85 Barbecue's), dark grey backpack (85 Barbecue's), silver foam tanks (85 Barbecue's), long black hose (common). If BARBECUE hadn't joined G.I. Joe he would have been the seventh member of his family to become a fireman in the Boston Fire department. His love for the job is not based upon his family loyalty or even a more general sense of duty; he simply likes riding on the back of the truck with the wind in his face, sirens wailing, lights flashing and the bells clanging. Being allowed to knock down doors and smash windows with his axe is just frosting on the cake! "When he hooked up with Slaughter's Marauders, the rest of the unit knew they were in for a real 'barn-burner'! You see, Barbecue has a knack for keeping things under control. Whenever the Marauders get caught in a firefight, it's Barbecue that keeps the troops as cool as cucumbers. With him there, Slaughter's Marauders aren't going to get 'burned' by Cobra!" Toy Notes: Item #6560-5. 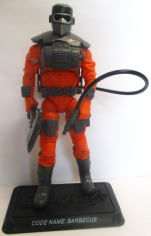 The prototype pictured in the catalog has light green instead of dark green on his lower legs. Accessories: yellow water cannon (91 Flint's), yellow backpack with red water bulb (91 Flint's), black figure stand (common). Already pre-trained and well-experienced in wearing cumbersome protective suits under fire in hostile environments, BARBECUE is the perfect addition to the Eco-Warriors! As well as being fireproof and solvent-resistant, Barbecue's new protective suit is air-conditioned, and contains a closed-system breathing apparatus with a one hour oxygen supply. It's the ideal thing to wear to the next burning oil well or toxic chemical leak. His helmet is equipped with a handy snap-off visor so that he can still open a bottle with his teeth! Motto: "Makes no difference to me if it's a four-alarm fire or a warehouse full of oozing toxic sludge, as long as I get a chance to knock down doors with my axe, you can count me in." Toy Notes: Features a temperature-based color change. Item #6822. In the 1992 insert catalog, concept art appears instead of the actual figure. Accessories: dark grey extinguisher pistol with hose peg and textured grip, no notch on side (new), dark grey fire axe with textured handle and silver edge (new), dark grey armored mantle protecting collar and shoulders (new), dark grey frame backpack with clips on side for tanks (new), red foam tanks with peg for hose (new), medium-length black hose (common), black Joe figure stand. If Kelly hadn't joined the G.I. JOE Team he would have been the seventh Kelly in his direct line in the Boston Fire department. His love for the job is not based on family loyalty or even a more general sense of duty. He simply likes riding on the back of the truck with the wind in his face and sirens wailing, lights flashing and bells clanging. Being allowed to knock down doors and smash windows with his axe is just frosting on the cake. "BARBECUE is what you call your basic party animal. He can open bottles with his teeth, pick up quarters with his ears, and wrap his lips completely around the bottom of a quart soft drink bottle. You may well ask how all this affects his function as the G.I. JOE team's firefighter. It doesn't. It simply makes him a more interesting fellow to have around."